We are an association of tutors based out of Owen Sound and serving Grey, Bruce and Simcoe counties. Port Elgin, Collingwood, Hanover and surrounding areas. We have brought together some of the most qualified and experienced tutors in the area to help meet the educational needs of students. All of our tutors are caring individuals who put the education of their students as their first priority. We provide one on one instruction for elementary, secondary and post-secondary students. Because Georgian Tutors operates on a non-profit basis, our rates are reasonable and any money that we receive goes to ensuring the highest quality tutors and resources are assigned to each student. If you or your child needs that extra bit of help to succeed in school, consider us for all of your tutoring needs. We offer tutorial services to people at all ages and stages of life. Does your child need a little extra help in grasping the 3Rs? Are you a high school student struggling with mathematics or chemistry? Have you failed the grade 10 literacy test and want help studying for next year’s test? Do you lack the necessary skills to write a successful essay? Are you studying for your GED so that you can get that promotion at work? Are you making a career change but need to upgrade your reading, writing, and math skills before taking a college course? We are here for you. Whatever your academic needs, we have tutors who can assist you to become a successful independent learner. Since we work one on one with our students, we can help them to identify both their weaknesses and strengths. We use our students’ capabilities to develop better learning strategies that can be transferred to future learning situations. Our goal is to work ourselves out of a job! Our students gain in self-confidence as they work with us. Our greatest reward is watching the smile of satisfaction on a student’s face as he/she masters a particular skill or solves a previously insurmountable problem. That delights us beyond measure. So come and smile with us — with a little help from one of our caring, professional tutors you too can achieve your dreams! 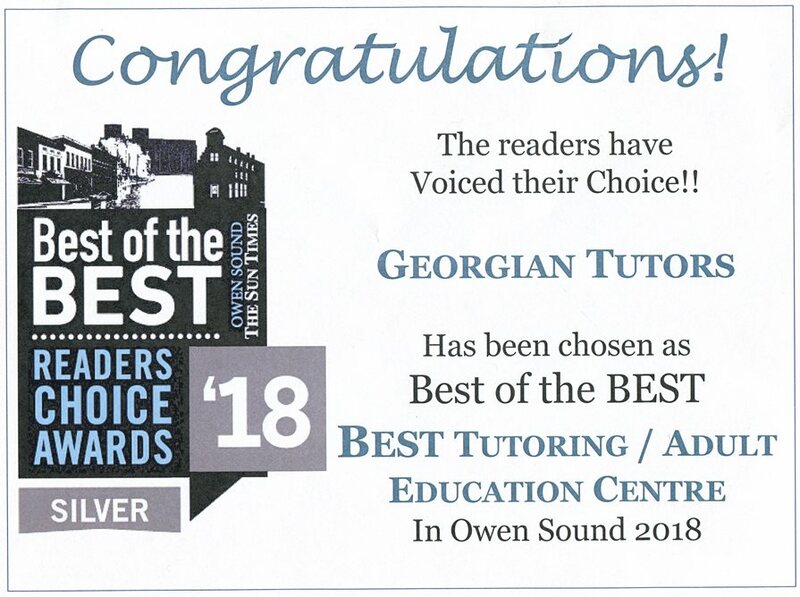 We look forward to hearing from you if you live in Owen Sound or the surrounding area and are considering hiring a professional tutor. Give us a call at 519-371-8049 and see what we have to offer. Or email us at info@georgiantutors.com and we will get back to you promptly. Individualized instruction based on the needs of each student. Provide support for online courses. Experience working with students who have special needs.